today's tattoo tuesday body art feature two fellows (and i'm happy to say new friends) from my 'hood - nick (top) and dave. nick i met because of a cat and dave i met because of the beautiful portrait of mary that graces his arm. story one - meeting nick. one day a few weeks ago i crossed the street purposely to meet nick; he was walking down the street holding the handsome orange cat you see in the snap. i was curious, one doesn't often see people taking cats for a walk. lately i've been thinking about training a new future cat and i've been fantasizing about how to go about training a young cat to be a therapy cat. i think it would be great to have a cat i could take around to nursing homes or special centers - but that's another story and no time to get into that here. well it turns out that the cat wasn't nick's - he said he saw the cat as he was going down the street and noticed that it looked a bit forlorn and lost. he called to the cat, the cat came over, he picked the cat up and that's about when i wandered over to meet nick and the cat. he was trying to figure out what he should do - the cat was very friendly and obviously not a stray. we talked a while about nick's options and when i left nick and the cat, nick settled on a plan to walk down the street and go up to each house and ask if the cat lived there. if he couldn't find the house where the cat lived he was going to take the cat home and then move on to plan b. well, about five minutes later i was in front of my house and a car stopped in front of the house - it was nick. he told me that a couple minutes after i left him, he went up to a house and before he had a chance to talk, a man barked at him, "hey, what are you doing with my cat?" nick explained why he was holding the cat and that was that. 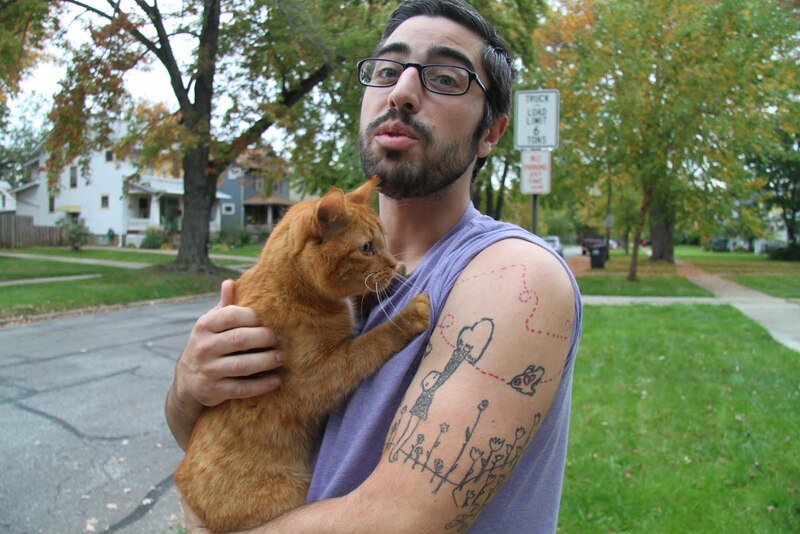 well this story has absolutely nothing to do with nick's tattoo - seeing nick's tattoo was an added bonus to meeting nick and the orange cat. when i was talking to nick i couldn't help but notice his wonderful, cheerful tattoo - of course, i asked if i could take a photo and share it and also asked if he designed it. nick was very gracious and told me yes, i could take a photo and share it, but, no he didn't design the tattoo. the design comes from the artist yann black - i can't recall now the back story to the piece, but recall something about the circle of life and nature and so on and so forth. nick, if you see this help me out! story two - meeting library dave. the other day while walking by the library, i happened to see dave with a couple other fellows who work at the library. i shouted out a hi to one of the guys who is a friend and gave a nod to dave and the other guy. i was instantly struck by dave's amazing tattoo of the virgin mary and asked him about it. he said when he lived out west he was impressed with many of the religious tattoos he saw there and decided that he really would like one - hence mary. there is name under the image, the name is of his young daughter who is the apple of his eye and delight of his life - so library dave's tat is a celebration of life tat! i like that! 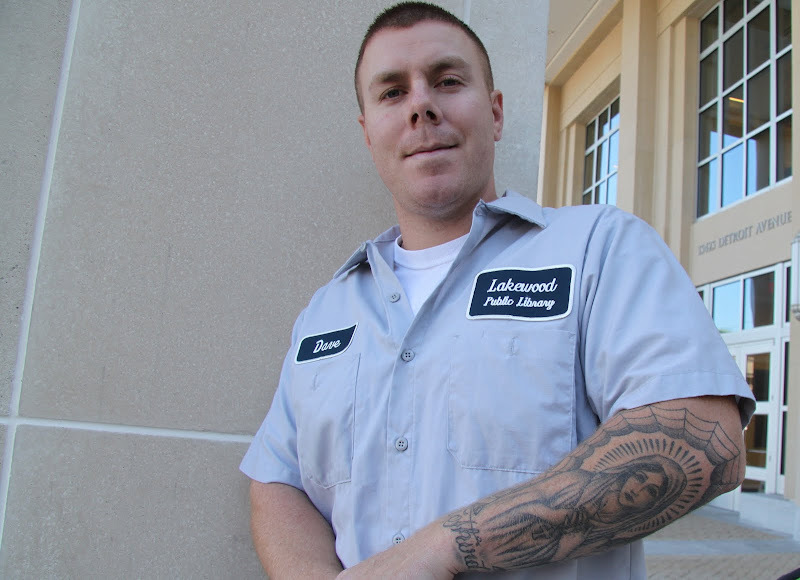 Very cool post, very interesting tattoos and very lovely Dan Fogelberg song. Thanks. I am not a great expert on body art - I suspect you do not see as much of it over here, but it is getting more popular. However it is good to see that a variety of styles are emerging rather than the ubiquitous "Mother" or phrase in Chinese characters. I Have Never Had A Tattoo.Partly,I Think ,Because I Feel Myself A Very Indecisive Person...(I would never trust the choice I made,& therefore regret my choice later) But, I Would Be Proud to wear both Nick & Dave's designs. i always thought Toby would be a good service dog, except that he is way too excitable. wish i had the biceps to get a gnarly tat - and i would probably design it myself. My daughter's friend recently got a tattoo of the tree of life, and she plans to fill it in as her own life progresses. I thought that was pretty neat.